On September 13th, 1996, Dragon Ball Z aired for the first time on American television. 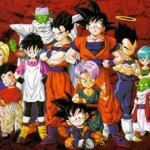 It wasn’t until three years later on September 13th, 1999 that DBZ first aired on Cartoon Network’s Toonami block, which led to an enormous rise in popularity of anime and manga here in the U.S.
Here’s to 15 years of epic battles, late night pizza party DBZ marathons, and the most influential and groundbreaking anime series of all time. Thanks for making the world of geek more awesome than it already was.